A Micro-enterprise by definition is a business with five or fewer employees, small enough to require initial capital of $35,000 or less. According to the Association for Enterprise Opportunity, one out of six U.S. private sector employees’ works for a microenterprise. 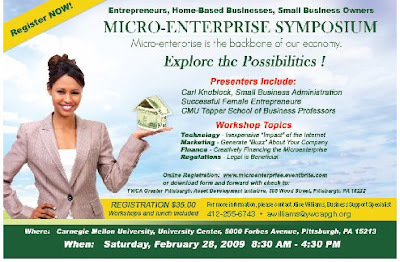 The YWCA Greater Pittsburgh supports Micro-enterprise through our Enterprising Women Program. Cost is $35.00 that includes lunch.